Hair Extensions for fine hair is a great way to thicken your hair. About 10 years ago, hair extensions were starting to “trend” or at least, becoming more mainstream, and that was about the time that I decided to go get certified. Over the last 10 years, my curiosity about the types of hair extension applications grew, too. That curiosity led me to get certified by several companies for various application techniques. I think, in life, we learn from “trial and error” and that’s where experience is born. In my own professional and personal experience, I have found that the brand Great Lengths was just the right fit for my business and artistic needs. Quality is the one word that I can share with you, if I had to pick just one word. The education that I received from Great Lengths surpasses the other education experiences. Fine hair that lacks body can only get so much help with the use of styling products. However, if you choose to add more hair you will be able to have more styling options and may be able to choose that “trendy” haircut. Hair Extensions are not just for long hair. Your hair only needs to be 3 to 4 inches to add some volume. It’s unfortunate when I hear stories from clients, that I have worked with, that have had bad hair extension experiences. Some of the cases, involve fusion hair extensions, and the stories are the same. They have shared that the size of the bonds were horrible, painful or sloppily done. Micro-bonding (as shown) is a type of customization of the keratin bonding material, where I size down the attachment. 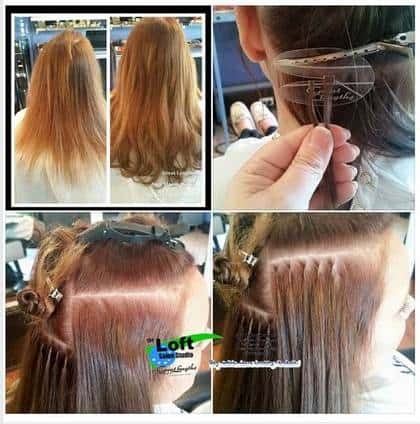 This will result in “virtually undetectable” attachments, that will be comfortable and will respect your fine hair; without weighing it down. Your hair extension service may take slight longer to provide, however the end results are well worth it. Is located in Western Ma, but even if you live in Boston, CT or Worcester….it will be worth the drive.